Many well-known mods make it easier to break blocks (hammers, quarries, veinminer), but not many focus on placing them. Even the most experienced players still often place blocks one by one. 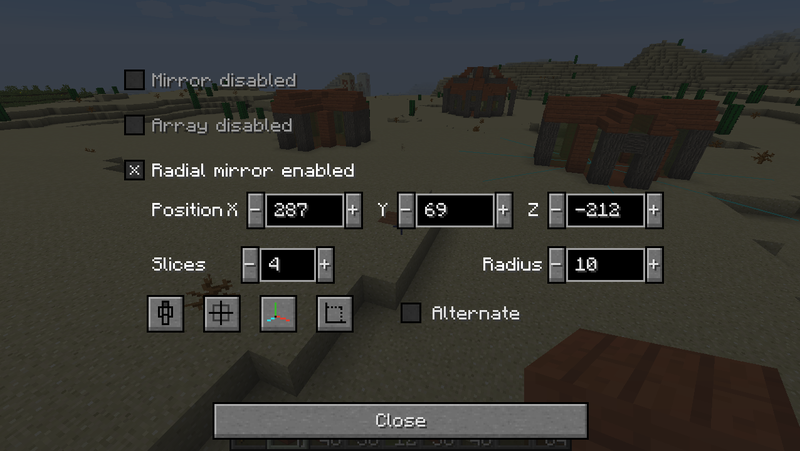 This mod makes building easier by providing tools like mirrors, arrays, build modes and a block randomizer. Switch build modes by holding ALT. Open modifiersettings with the + key on the numpad. Hold ALT to switch build modes. Holding ALT is compatible with the radial menu of Chisels and Bits; when a chisel or bit is held, it will open the Chisels and Bits menu, otherwise the build mode menu. Mirror blocks in realtime, as you place them. Works with even and uneven builds (add .5 to the position). Rotates blocks like stairs, logs, slabs, pistons etc properly. Set position, radius (size) and what axes to mirror by pressing the + key on the numpad. Size (radius): how many blocks away from the position the mirror will still work. Limited by your reach. 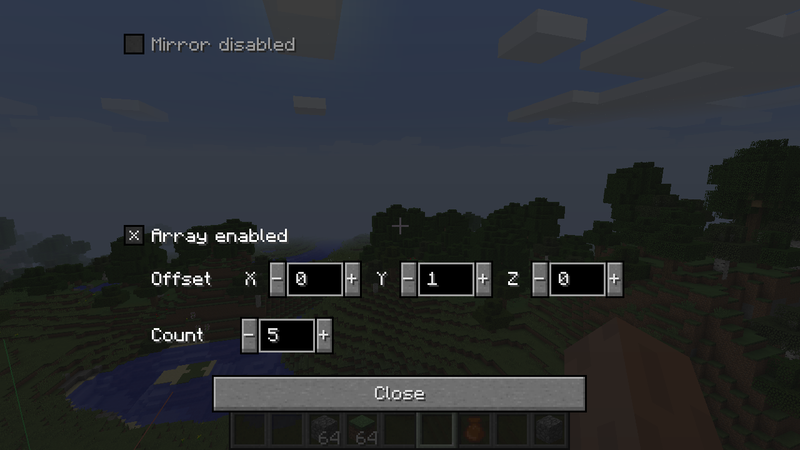 The array modifier copies your build in a certain direction a certain number of times. Very useful for nether tunnels but also useful for quickly building walls etc. It is possible to add offset to multiple directions so diagonal builds are possible (e.g. a nether tunnel that goes upwards or sideways). And of course breaking blocks is also supported for if you make a mistake. Set offset and count by pressing the + key on the numpad. Offset: in what direction to replicate your block. Example: with offset (2,1,0) and count 3, placing a block at (0,0,0) will also place blocks at (2,1,0), (4,2,0) and (6,3,0). The radial array lets you place blocks in a circle around a certain point. The circle can be divided into slices, and each slide will copy your block placements. I heard you liked mirrors, so I put mirrors in your radial mirror. Mirror every other slice by enabling alternative mode. Set position, slices, radius and alternative mode by pressing the + key on the numpad. Slices: the amount of slices to cut the circle in. Each slice copies your block placements. Radius: how many blocks away from the position the radial mirror will still work. Limited by your reach. Put blocks in the bag, then rightclick to place a random block from the bag. Adjust ratios by filling slots with the same block (e.g. 2 slots cobble + 1 slot stone makes for a 2:1 ratio). Handy for building walls and paths with variation. Combine with array and QuickReplace for super easy path building. Craft by surrounding any wooden planks with leather. All actions consume the right amount of blocks. You have to use the appropriate tool to break blocks. This correctly damages the tool based on how many blocks are broken. Replacing only works on blocks that can be harvested by hand. Mining speed is increased for each additional block mined (change percentage in config). Press the - (minus) key on the numpad to toggle QuickReplace. When on, new blocks you place won't be put on the block you are looking at, but replace it. Handy for swapping out floors or replacing materials in general. Replaces underneath tall grass for your convenience. Note: in survival mode QuickReplace only works with blocks that can be harvested by hand. Your reach determines how far away you can place blocks. It also determines the maximum radius of the mirror and the reach of the array. Increase your reach using craftable reach upgrades. They need to be used in order, it is not possible to skip straight to upgrade 3 without using 1 and 2. Toggle between creative and survival mode by pressing F4. "Can I add this mod to my modpack?" "Is this a client-side only mod?" No, it needs to be installed on both server and client. The server part places all the blocks and verifies the players input. "Am I allowed to make my own version of this mod?" Yes, as long as you comply with the LGPL-3.0 license (usually this means: link to this page, license your modification under LGPL-3.0, make the code visible and state significant changes). Quick replace isn’t working for me. I’m in survival. Does it only work in creative mode? ERROR REPORT: Hard crash when equipping anything from Blockcraftery to hand while Effortless Building is installed. Seems to be a rendering error. Excellent job on this mod. I have it as a central focal point of one of my modpacks that encourages people to build as it contains a variety of the decorative mods like Chisel and what-not. It's got its own page on the Modpack Pages lol. Nearly ready to start porting, I think. That said, 6 new issues were reported the last week, which I fixed today. If they keep piling in, it might take a while. 1.13 might seem stable but the new features in my mod are not, that comes first. I understand. Thank you for your fast response and relentless work!! cant wait to see what more this can become, its already such a powerfull tool! i really like the ALT menu, and used it alot! :D still could wish for a flat cylinder tool for towers floors and such. I do plan on adding a circle tool, because it has been requested a few times now. I might even add a cylinder tool so you can build circular towers even easier. Although that would already be doable with circle mode and array modifier. It's even already possible with radial mirror and array, just a bit difficult to set up. btw is it possible to make randomizer bag bigger? The reason it has only 5 slots is because it shouldn't be an extra inventory bag in survival, the recipe is too cheap for that. I might make a second randomizer bag with a more expensive recipe and a bigger inventory. Undoing isn’t working for me. It’s showing the red animation but not actually removing any of the blocks. Could you add swapping functionality? What do you mean by swapping functionality? Switching build modes is fast as it is and quickreplace already exists. Oh, sorry, I didn’t see that this functionality is already in the mod. 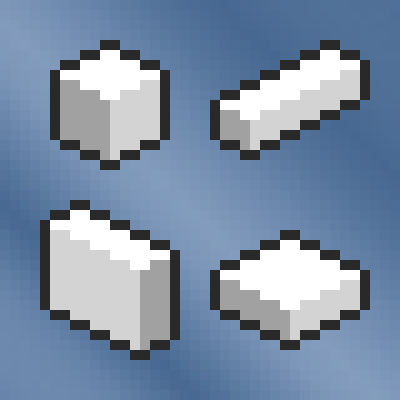 However, I have a two suggestions: Could you make it so that you can swap blocks that can’t be broken by hand? Maybe it could be a config option? Because as it stands, it seems mostly useless, as most building blocks have to be broken with a tool. However, it’s still very useful for making floors where there is grass. Also, does it support replacing blocks in a larger area, similar to how you can drag the cursor to build in a large area? I’d like to see something similar to what the Building Gadgets mod’s exchanger tool can do. I apologize if any of this is already incorporated in the mod. I haven’t actually used Effortless Building myself yet; I’ve just added it to the private modpack I’m making, which I haven’t started playing yet. Your mod is absolutely brilliant, though. Could you make it so that you can swap blocks that can’t be broken by hand? Maybe it could be a config option? This has already been suggested, and will be implemented with time. Also, does it support replacing blocks in a larger area, similar to how you can drag the cursor to build in a large area? 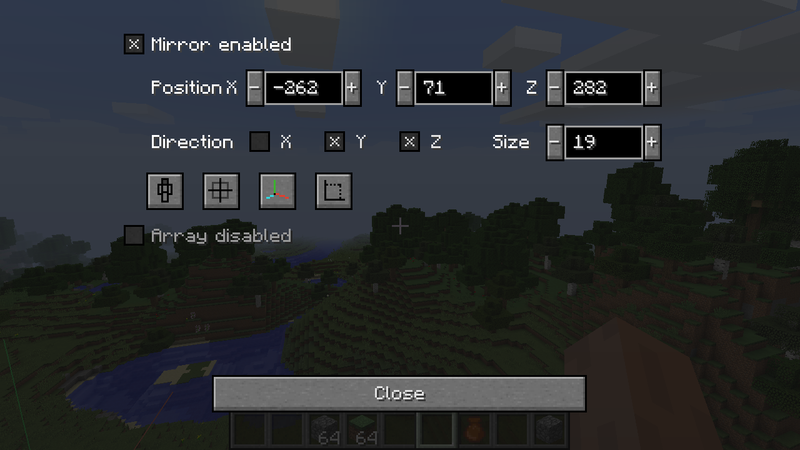 You can use any buildmode to replace blocks, just toggle QuickReplace on (either in ALT menu or with numpad-minus). Hope this helped. If you have anymore questions just ask. Thanks for answering! I’m excited to see that implemented. Will the same go for undoing, too (that is, undoing the placement of blocks that can’t be broken by hand)?